This scam was first reported two days ago ( 6 Feb 2018 ). Since then, it has been discovered that along with Chrome, Firefox and Brave browsers are also affected. This scam works by flooding the browser with 2000 download requests, right after the victim sees a web page that looks like a warning. The victim’s computer CPU and RAM spike to 100% and their computer will stop responding. This makes it more likely that victims will pick up and call the toll-free FAKE Microsoft support number, give the scammers a credit card number and allow them to connect to their computers. We want to keep you safe. Do not call any Microsoft or tech support numbers you see that suddenly appear on your browser or computer screens. Legitimate companies do not do this. If this happens to you, immediately close your browser. If you can’t close your browser use Ctrl+Shift+Esc to open Task Manager and close all browser processes – for example chrome.exe. If you reopen your browser immediately after the attack you will be flooded with more of the same… restart your computer before you open your browser again. When you restart your computer, open Chrome. If Chrome asks if you want to restore the pages that were open when you restarted your computer – it’s IMPORTANT that you click “NO”. If your computer is frozen because CPU and RAM are at 100%, turn off your computer at the switch. When you turn your PC back on and open your browser, be sure you choose “NO” when your browser asks if you want to restore the pages that were open when Chrome was closed. In all cases, after you’ve recovered from the attack, it’s important that you reset your Chrome browser and clear your browsing data. Read this post on how to reset your Chrome browser and clear browsing data. 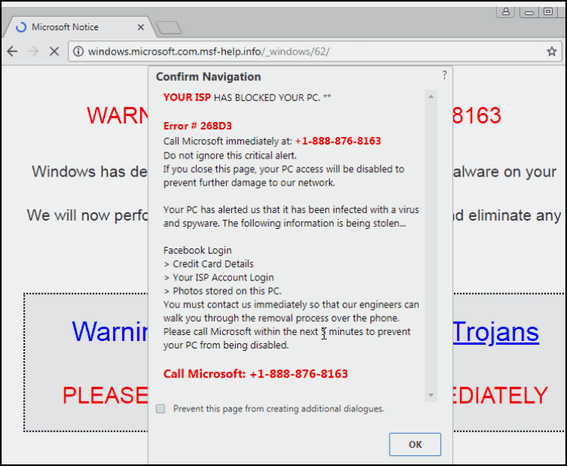 Con artists pushing tech-support scams have an arsenal of ways to lock up the browsers of potential marks. On Tuesday, a researcher disclosed a new weapon that freezes Google Chrome, which, by most measures, is the Internet’s most widely used browser. The point of all the techniques is to render a browser unusable immediately after it displays a fake error message reporting some sort of security breach. Given the appearance of a serious crash that can’t be fixed simply by exiting the site, end users are more likely to be worked into a panic and call the phone number included in the warning. Once called, the scammers—posing as representatives from Microsoft or another legitimate company—stand a better chance of tricking the caller into providing a credit card number in return for tech support to fix the non-existent security problem. The scams are often transmitted through malicious advertisements or legitimate sites that have been hacked. Read the rest of the Ars Technica article here. I so appreciate all of your knowledge that you share with us and I never want to stop learning. Knowledge is a powerful tool to keep one from errors in life. You are a wonderful company to be part of and I thank you both for sharing with all of us. Have a blessed and happy day and thank you again. I was informed that the cure was to immediately hit Control Alt Delete. Nothing else! CTRL + ALT + DEL will open a menu from which you can choose Task Manager. The faster way to open Task Manager is CTRL+SHIFT+ESC. It directly opens Task Manager saving you the extra step of clicking Task Manager in the menu from CTRL+ALT+DEL. In Task Manager you can try to close browser processes. However, if your CPU & RAM at maxing out, when you press CTRL + ALT + DEL nothing will happen (or it will be painfully slow in opening and stop responding). This article is scary, scammers locking up the Chrome or other browsers…. It’s a good article, saying most times it can be unlocked by using Task Manager…. Not being computer savvy, What is the procedure to get out of that scam page ?? It kinda leaves you hanging without proper instructions. If this happens to you, close your browser. If you can’t close your browser use Ctrl+Shift+Esc to open Task Manager and close all browser processes – for example chrome.exe or firefox.exe. If your computer is frozen because CPU and RAM are at 100%, turn off your computer at the switch. When you turn your PC back on and open your browser, be sure you choose “NO” when your browser asks if you want to restore the pages that were open. The BIG FIX, online changes,nothing monetary, zero zilch, pay bills with cash or cheque, employment for mail-men/ people, employment for infrastructure and company accounts people, shopping by look, feel touch. An end must be placed on this planet’s technological explosion, created by humans who lack the ability to think or act in what was once known as a ‘normal’ manner. Our beautiful plants, creatures and humans, our unique and wondrous planet, our one and only life which should be a joyful experience every day and night until we die …. is being destroyed by the selfish floating scum, sub-human, poisonous creatures who don’t deserve the opportunity to breathe Earth’s oxygen. For us seniors, I’m surprised that you are not telling us what we should do in the event of such a scam. Do we just reboot our computer or what? We have added it, but the article pointed to has info on what to do. I will be sure to print this out and save it. However, I have a better idea, one of you could move in here and my puter would always know what to do😀Seriously, keep feeding us all this very useful info and thanks for all your help. Have a good weekend. It also happened to me.I think it was the 6 0r 7 th. I got scared and shut down before the the error message Popped up. Then I went to Restore. It was a day or so before I got my Programs working again. I forgot what to do when the Virus Message came up. I even unplugged everything.! Glad now I know what to do! I Printed out all the INFO. You gave us.